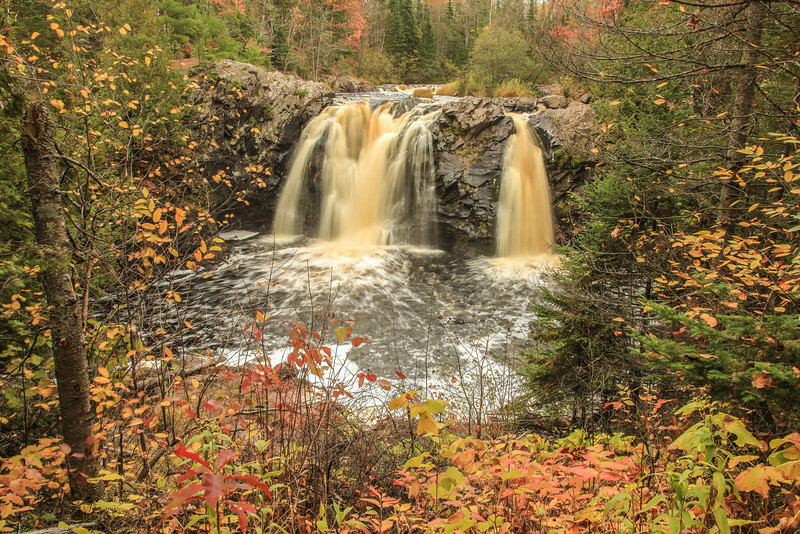 "Autumn's Last Call - Little Manitou Falls"
After our recent trip to Wisconsin to photograph Sandhill Cranes we decided to take a different route home from the route we usually take. We traveled home through Wisconsin via Highway 35, which brought us right through Pattison State Park. Pattison has two very nice waterfalls that are very easy to see after a short walk on the park trails. 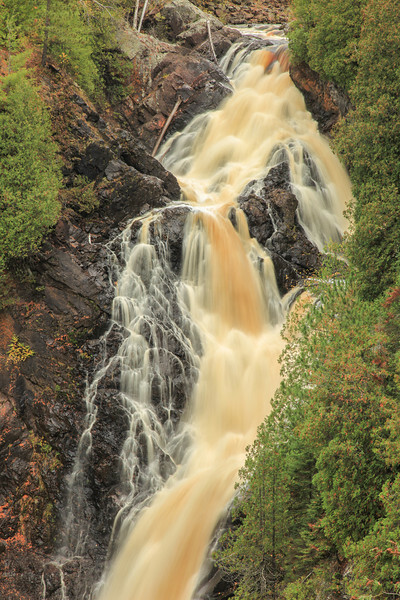 A drop of 165 feet makes Big Manitou Falls the tallest waterfall in Wisconsin. While fascinating to see, I did not find Big Manitou Falls overly interesting to photograph. I had more fun photographing Little Manitou Falls, which is 31 feet high according to the park literature. I just found the shape and overall character of the smaller waterfall to be more interesting than the big one. We enjoyed this park and will be stopping here again in the future for sure! "Mountain Ash Color at Partridge Falls"
Just a quick post today of one of my favorite waterfalls, Partridge Falls on the Pigeon River. I always love visiting this waterfall, it never fails to impress! 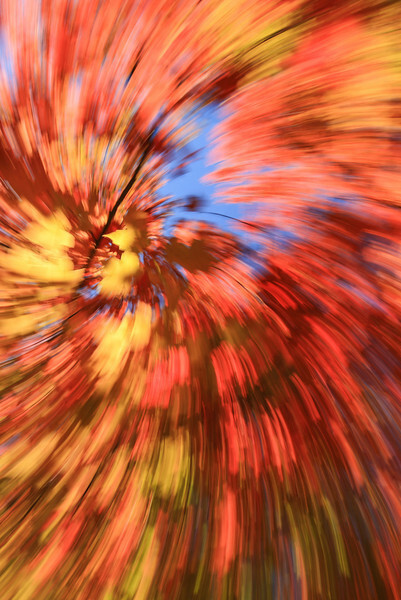 This photo was made during the last bit of fall color at the falls this year. The water level is a lot higher this autumn compared to autumn last year. It's that time of year again where I am not doing a lot of shooting so I am going through some old photos and looking for things I wanted to post back when I shot them, but for whatever reason never got around to posting. Here is one such photo from September 2008 that I made on an early morning hike along the Pigeon River in Grand Portage State Park. I started out well before sunrise so I could make it to Middle Falls in time to photograph the first light on the falls. I got there with time to spare. In fact, I had to wait for the sun to come up high enough to start hitting the waterfall. As I was waiting the sun was starting to light up the opposite shoreline of the river and when it did, the reflections on the water really started to jump out at me. I attached my 100-400mm lens and zoomed in on different areas of the water, taking advantage of this magical light. The colors that you see in the water here are reflected blue from the early morning sky and colors from the trees that are in full sunlight on the opposite bank of the river. The area of the water that I was zoomed in on was still in the shade, but was reflecting the light from everywhere else around me. 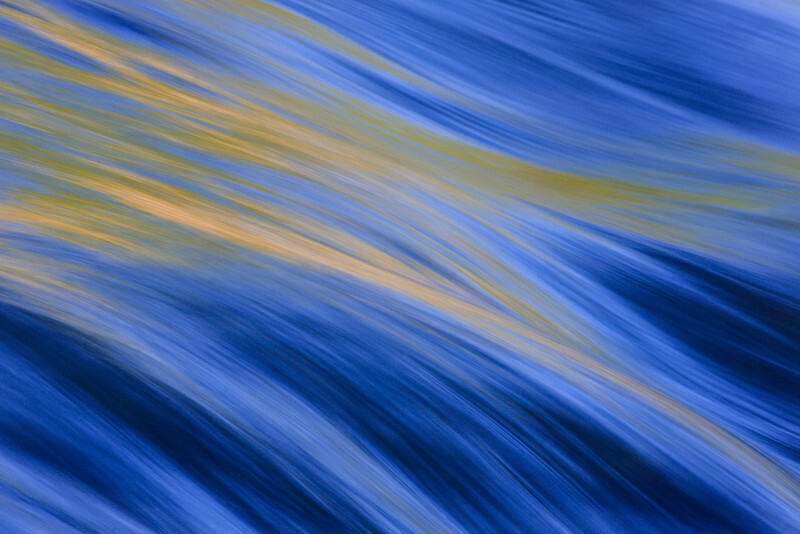 I did get some nice wide-angle shots of Middle Falls on that day, but my favorite shots of the morning were these beautiful abstracts out in the middle of the river. Once the sun was up high enough and the entire river was in full sunlight, the beautiful lighting that you see here was gone, at least until the next morning. 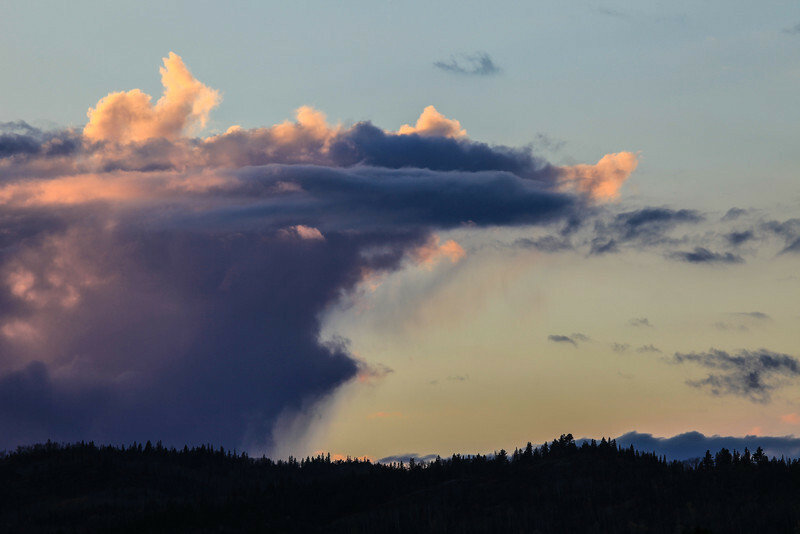 Here is a recent shot of some rather interesting clouds at sunset over Grand Portage Bay. Upon first glance the shape at the top left of the photo reminded me of a rabbit and the first thing I thought was "Hey, there's a rabbit riding on top of that cloud!" Thus, the title for this image was born. The rabbit shape was only there for maybe about 15 seconds before morphing into another, more abstract shape. If you're ever in Superior, Wisconsin (or Duluth, Minnesota for that matter), you simply must take the time to drive a little south of Superior to check out Pattison State Park. 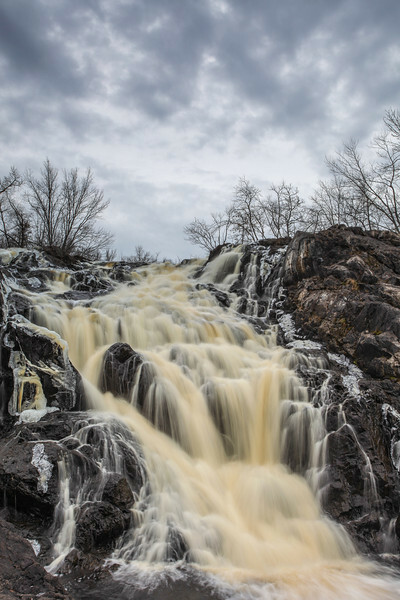 There are two beautiful waterfalls there, one of which is Wisconsin's tallest. According to the park literature, Big Manitou Falls is 165 feet tall. While I found Little Manitou Falls to be more photogenic, Big Manitou Falls is also worth a photo and some time to appreciate it's beauty. Both waterfalls are a very short walk from their respective parking areas. 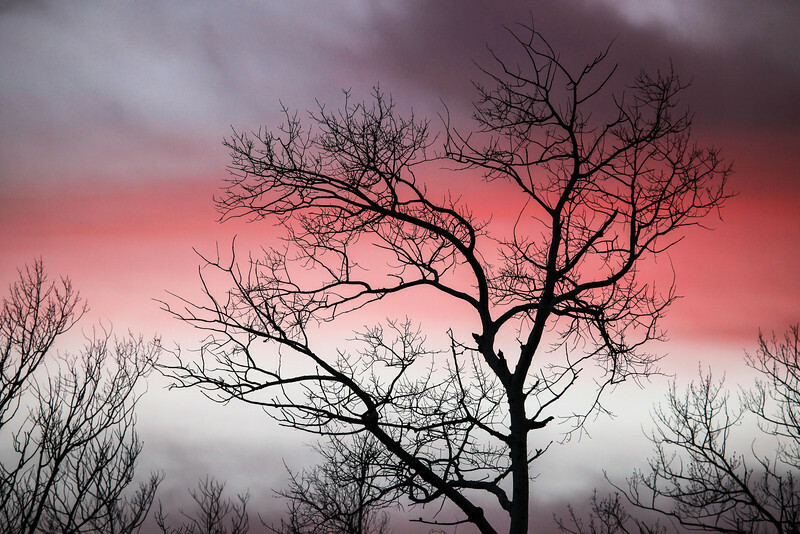 "November Aspen - Sunset Silhouette"
This evening's sunset was quite spectacular! I enjoyed the show while driving down Old Highway 61 in Grand Portage, stopping now and then to shoot a photo or two of the changing colors. 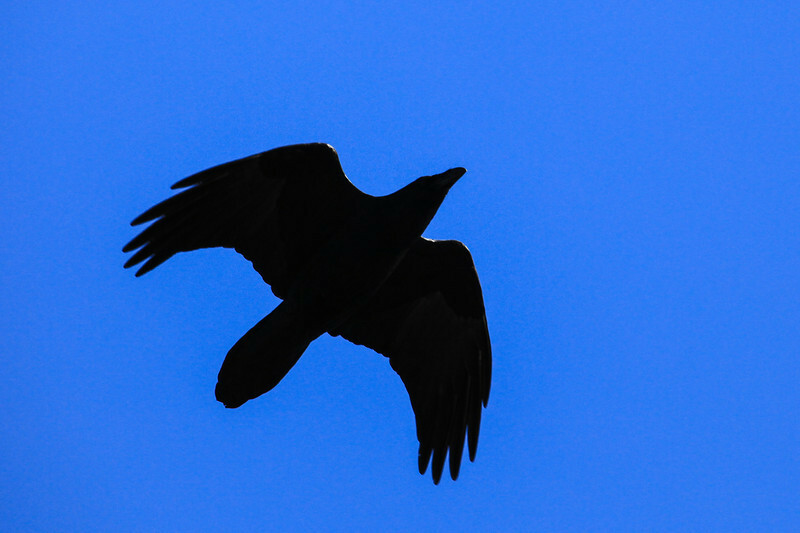 All of the photos I shot of sunset were taken with my 100-400mm telephoto lens. This line of Aspen tree silhouettes was my favorite view of the evening. The weather today was very wet and humid, with heavy fog blanketing the area for the majority of the day. I took advantage of the conditions and went for a walk to see what unique things I could find. 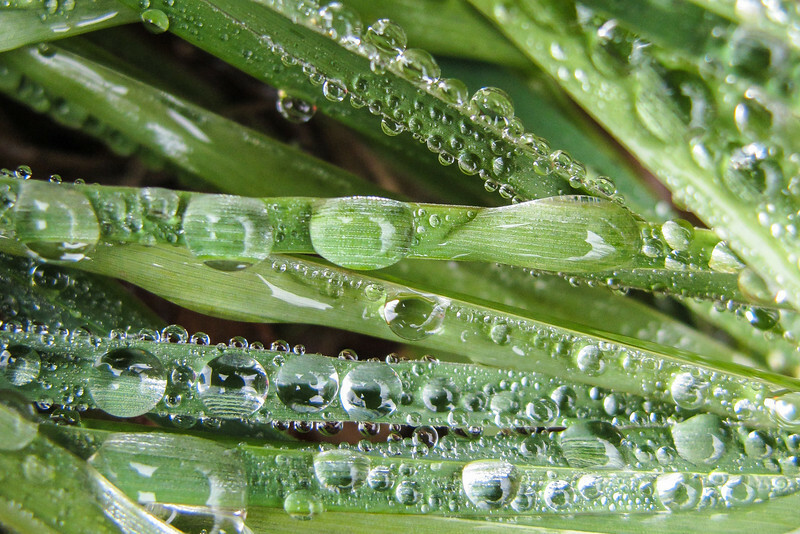 As I came upon a grassy field I looked down and noticed that many of the blades of grass were covered with perfect little water droplets. I pulled out my Canon G11, put it in macro mode, then laid down on the ground and started making images of this fascinating macro world. The G11 has a terrific macro mode which allows me to focus within roughly an inch or two of my subjects, allowing me to make interesting images of a miniature world that most people probably wouldn't even notice. I plan on sharing a foggy landscape image from today as well, but for now this one gets top billing as it is my favorite image of the day. 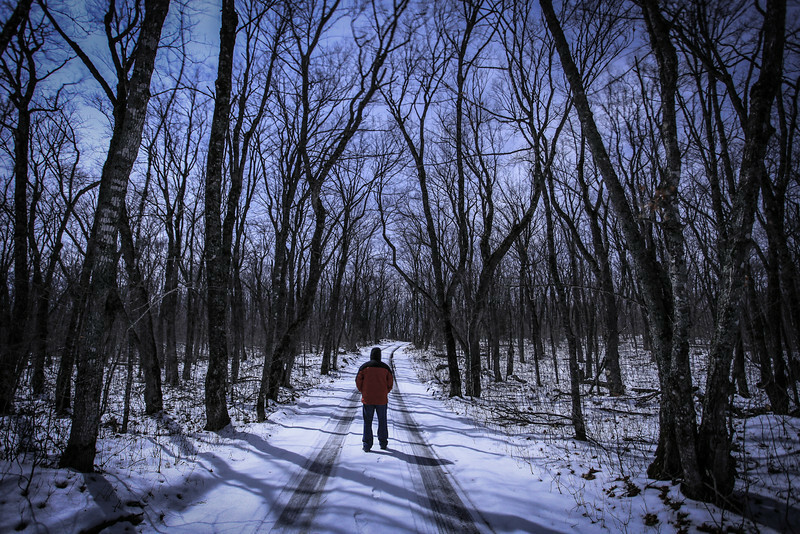 Here is a recent night-time exposure of myself walking down a forest road in the full moonlight. I just love this road and the beautiful stands of maple trees that line the majority of the road. I have taken countless photographs along this road and never tire of spending time there. This was a beautiful November night, with mild temps in the upper 30's and a light layer of snow on the ground. The tops of the trees were swaying back and forth in a light breeze as my foot steps crunched the surface of the snow. A sublime experience for sure! 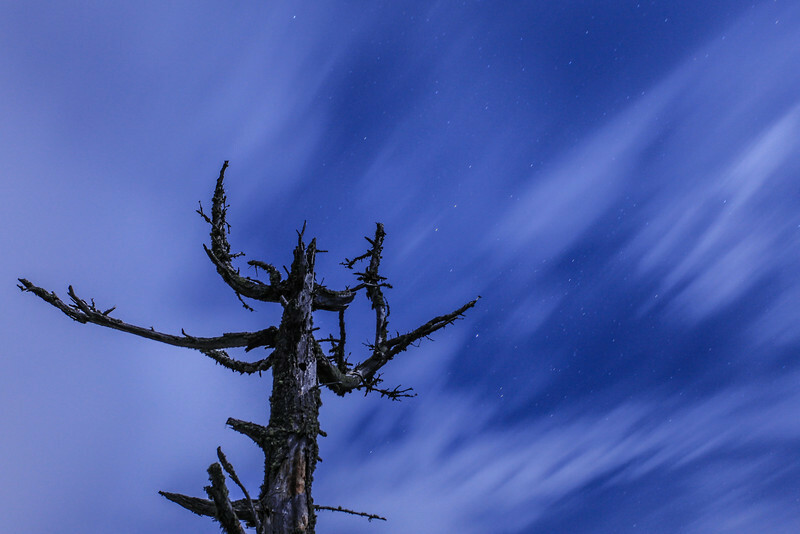 "The Conductor - Symphony of the Moonlit Sky"
I discovered this tree a while ago and have long thought of using it as a foreground for some night photography. This image is from the second time that I went out to photograph the tree. It was during the almost-full moon and on a breezy night with fast-moving clouds. To me the shape of the tree resembles the shape of a symphony conductor as they direct the musicians in the performance of a musical score. I think it makes for a pretty cool foreground for a night sky image! "The Conductor - Aurora Symphony"
Here is another night-time image of the tree that I have unofficially named "The Conductor". This photo was actually made BEFORE the last image that I posted of The Conductor. 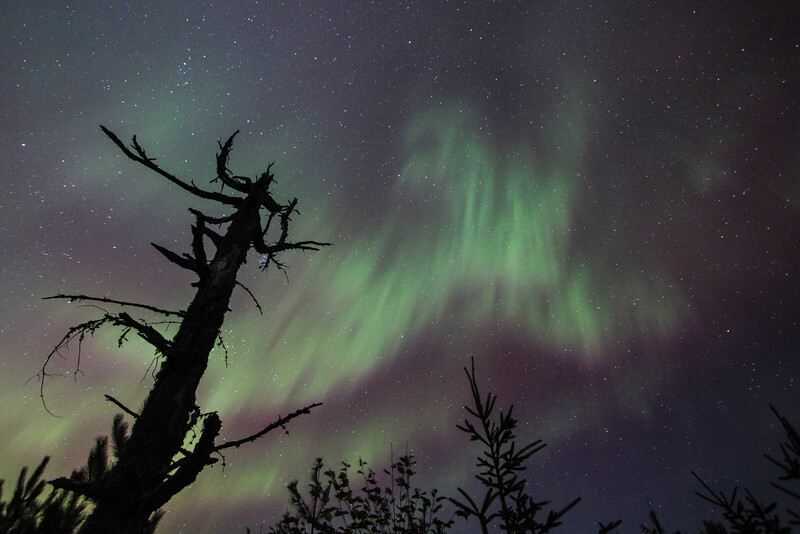 It was taken in early October of this year during a spectacular night of northern lights. While this is far from my favorite image of that night, it is nonetheless one that I like enough to share with all of you! Earlier this week Jessica and I were in Ely, MN "playing tourist" for a day. We had a great time walking the main street of Ely and checking out such places as the Brandenburg Gallery, the Piragis Northwoods Company store and the Steger Mukluks store. We also enjoyed a delicious lunch at "A Taste of Ely", a very nice local cafe that also features live music and a small art gallery. 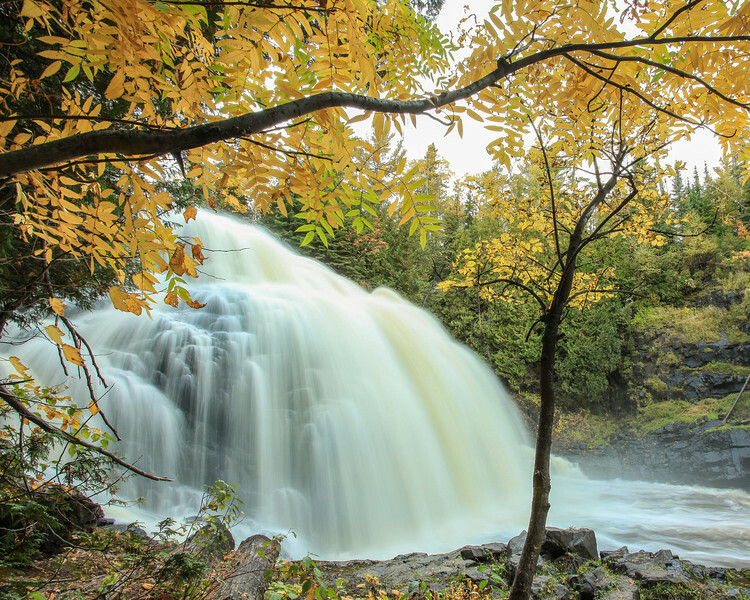 The first item on our agenda for that day, however, was a hike to Kawishiwi Falls, a beautiful waterfall located just a few miles outside of town. The hike to the waterfall was easy, winding through a very nice forested area. Even though it was a very overcast day we were lucky enough to have some nice definition in the cloud cover, making for a nice shot from near the base of the falls. I would highly recommend the easy hike to this waterfall if you are ever in the Ely area! 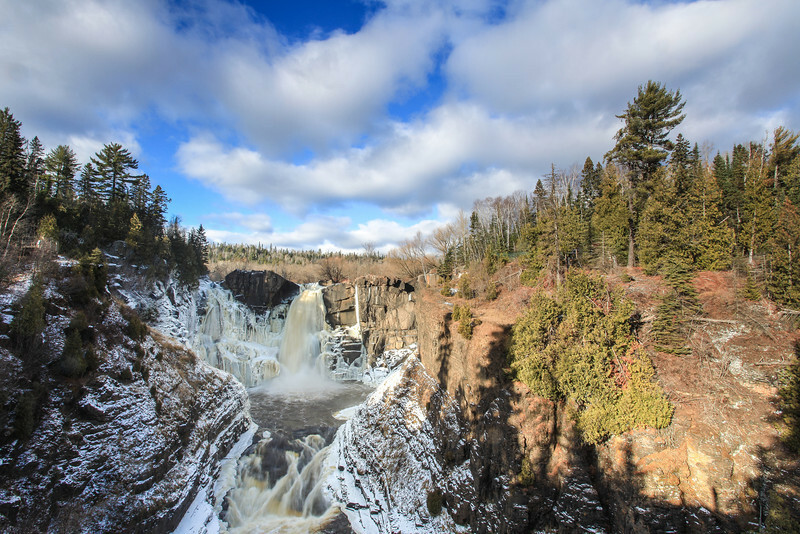 "Early winter on the High Falls Gorge of the Pigeon River"
Winter is coming, which is becoming evident at High Falls on the Pigeon River in Grand Portage State Park. This photo was taken yesterday afternoon when the sky was filled with beautiful clouds. I was a little surprised by the amount of ice already forming on the face of the falls, but then I realized that it is almost December already! I just love this photo of the falls. I think it is one of my new favorites of this location. I love the clouds, the ice, the tree shadows and the light. When I first arrived at the falls the sky was almost completely clear of clouds and by the time I left the cloud cover was really heavy, with no blue sky at all visible. Everything came together for this shot, and I happened to be there at just the right time to capture it! Yes! The season of ice is upon us! I love winter for a lot of reasons, not the least of which is the return of one of my favorite photographic subjects: ICE. Ice comes in an infinite variety of shapes and formations and I never tire of photographing it. 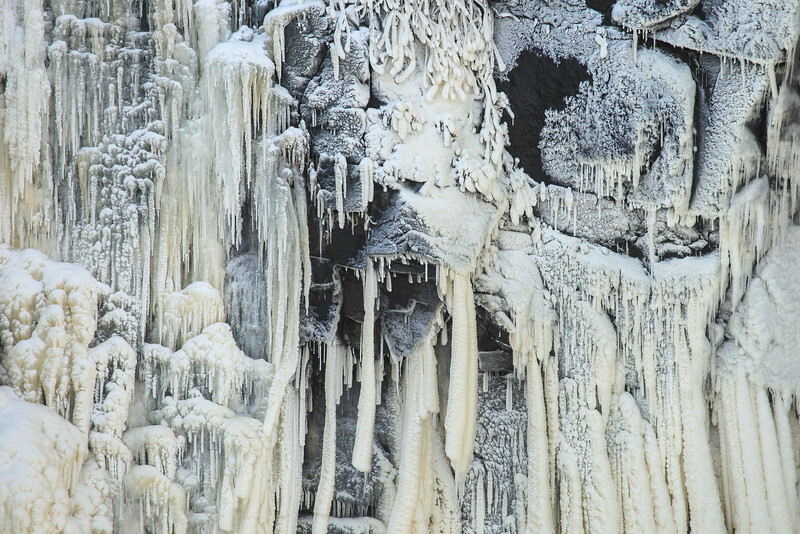 This particular "Wall of Ice" is the cliff face of High Falls at Grand Portage State Park in northeast Minnesota. The main channels of water on the falls are still running freely, but on either side of the running water is an amazing garden of ice. The waterfall freezes differently each year based on the water level and weather conditions. One thing is for certain, it is ALWAYS interesting and ALWAYS beautiful!